(Nanowerk News) Precious metals like silver and gold have biomedical properties that have been used for centuries, but how do these materials effectively combat the likes of cancer and bacteria without contaminating the patient and the environment? These are the questions that researchers from Dalhousie University and the Canadian Light Source are trying to find out. Zhang said that if you compare silver to current antibiotics, silver does not show drug-resistant behaviour. “But with silver, so far, we are not finding that,” he added. 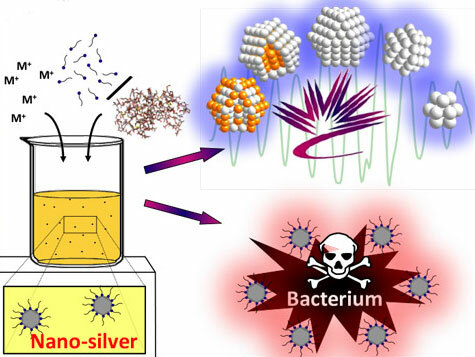 Finding out why silver is such a great antibacterial agent is the focus of Zhang’s research, recently published in the journal Langmuir ("Impact of Protecting Ligands on Surface Structure and Antibacterial Activity of Silver Nanoparticles"). Zhang said it is very hard to understand what is happening at the atomic level. Using small nanosilver particles is the most effective way, because when you make silver small, you can expect higher activity because of the increased surface area. This poses another problem however, as the nanosilver needs to be stabilized with a coating or the silver particles will bond together forming large pieces of silver that do not efficiently interact with the bacteria. Zhang’s group used two different coatings to compare the effectiveness of the silver as an antibacterial agent. The first was a small amino acid coating and the other was a larger polymer coating. And after testing the interactions between the nanosilver and the bacteria, and looking at the atomic structure of nanosilver using the CLS and the Advanced Photon Source, the researchers were surprised to find that the thicker, larger polymer coating actually created a better delivery method for sliver to inhibit the bacteria. Zhang said the next steps will be to find out if the nanosilver is actually attacking good cells in living systems before they can make any further progress on determining whether nanosilver is an effective and efficient antibactieral agent that could be used to cure human and animal diseases.